Multi-label sports and lifestyle concept store DOT has four locations in Singapore, including one within Tampines 1 shopping centre (10 Tampines Central 1). 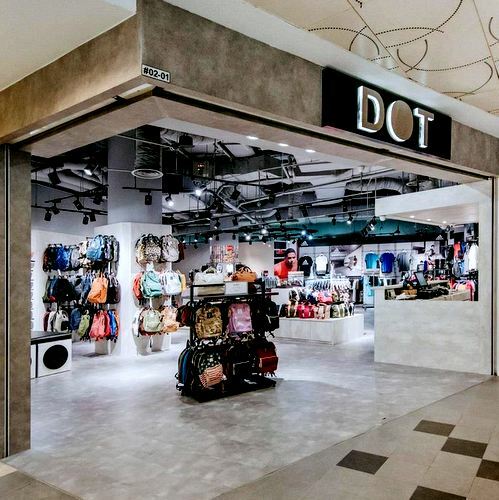 At DOT, you’ll find a wide selection of men’s and women’s footwear, bags, apparel, as well as accessories from international, well-known brands. The main brands available include Adidas, Anello, Birkenstock, Colors of California, Fjallraven Kanken, Gregory, Havaianas, Hellolulu, Herschel, New Balance, Nike, Nixon, Puma, Timberland, Beach Body, Converse, Skechers, Cabin Zero, Moses, Sperry Top-Sider, and Under Armour. DOT is operated by Link Millennium Pte Ltd, a subsidiary of Link (THM) Group, an established distributor and retailer of boutiques in Asia that works closely with international brands to develop distribution channels and regional marketing campaigns. The official Facebook brand page for DOT Singapore is located at www.facebook.com/DOTsingapore. Following the Facebook page, you’ll learn more about the available range of products, brands, DOT’s promotional offers, events, and much more.